Today I’m starting to get a hold of everything that I lost control of over the last 26 days when I was working or out of town, and the last 7 days where I just laid down and coughed. Today I am dealing with the wild roaming dust buffalo, the inbox full of email (there are thousands. I wouldn’t look for that to be wrapped up today) the laundry, so that Joe and I can stop wearing clothes that don’t match…and a possible trip to the grocery store so that dinner tonight doesn’t consist of a strange combination of foods from the back of the freezer. (I hate it when it gets weird like that. I can’t be the only one…) Therefore, a list of Random Things. Gifts for Denny purchased and dropped off at her abode. I will not reveal the contents of said “Frolic in a bag”, since I do not yet have confirmation that Denny got it….so you will have to use your imagination and know that Rachel and I are very gifted. I had planned to buy nothing for myself, but that fell straight out the window within seconds of my arrival. 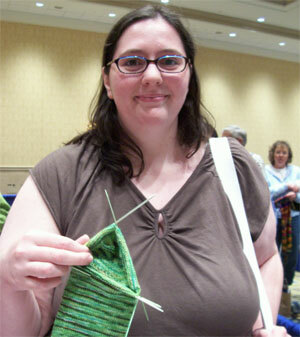 Ironically, my biggest purchase was at the Lettuce Knit booth where I discovered a yarn that was dyed just for me. It’s Dream in Color yarn (worsted) and it’s a beautiful rusty lime green that is so me that I literally gasped when I saw it. See? (Ok. It’s better than the picture. By a lot. 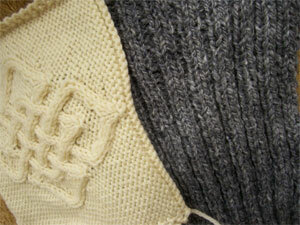 Subtle, gorgeous…Megan had all the colours packed up in bunches to make the wrap cardigan #263. (Scroll down.) 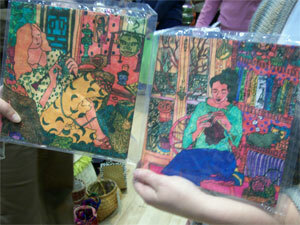 I bought the pattern too.) 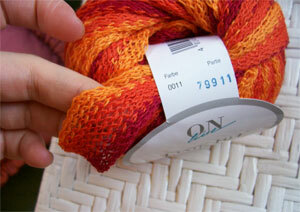 I also got some beautiful Canadian sock yarn from Red Bird Knits. 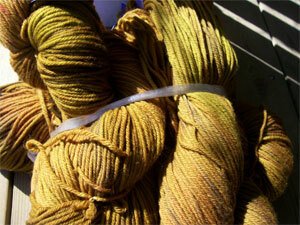 Ontario Romney sheep, Ontario Mill…Halifax dye job (from the Fleece Artist). I got the red wine colourway. C’est magnifique. Something I didn’t buy at the Frolic and regret now. These knitting lady lamps that were at the Main St. Yarns booth. They are paper shades with a bulb inside and I thought they were so beautiful that I have no explanation at all for why I didn’t buy one. (Except that they were a little pricey) I can only say that I was practising restraint and got carried away. It is bigger. It is still pink. I still can’t tell you what it is. There is not much time left to finish it. All will be revealed in the fullness of time. What I knit when I sort of wigged out from knitting the big pink thing. This scarf. Dudes, it was so much fun. Stupid big fun. The whole thing took about 2 hours…maybe less and it was as much fun as watching your daughter dump a jerk. (I’m imagining on that one.) It’s this crazy yarn that’s a wide knit ribbon, and you knit it just by picking up one side and giving it lots of room to ruffle. and the other would be reversed. I am almost ashamed of how much fun it was. 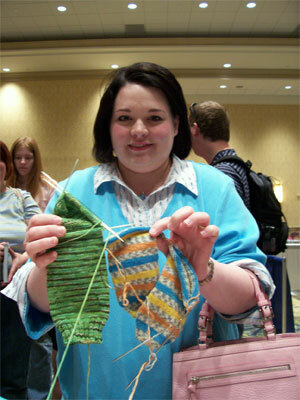 I got the yarn and pattern by CarlaK when I was at Knit One in Pittsburgh. They have more. Is not the knitting. That was fast, easy and fun. (Did I mention the fun?) but the challenge of not beating to death all of the non-knitters who are going to go absolutely bonkers over it at Christmas, even though it only took two hours and little skill to knit it, and even though they are holding a pair of hand knit socks (or a lace scarf, or something else that took me twenty hours and tremendous skill to knit for them) right in their hot little hands. It’s always like that. Novelty yarn scarf = the crowd goes wild. 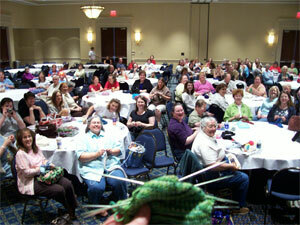 That today is The Knitters Frolic? I am so out of here. I’m taking the Subway to Rachel H’s house and we are going to carry our little selves there as fast as we can. I’m not taking any workshops this year, since this was originally planned as a birthday jaunt for my darling friend Denny. Sadly, Denny is having both a very bad day and a birthday today, and she can’t go, so Rachel H. and I have accepted the task of being her proxy shoppers. Rachel and I are taking this seriously. 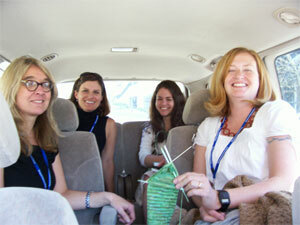 All of a sudden, the years of festivals, fairs and yarn shops make sense. They were about today. Rachel and I were being trained by the universe for this moment. This is the day for which we were born. We want nothing for ourselves, but our friend cannot make the frolic on her birthday but we have assessed the list of vendors, planned a route and will not let our Denny down. 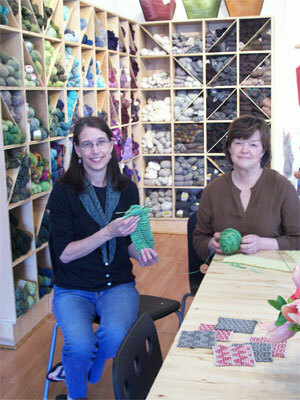 If you see us, feel free to say hi, but …you may do well to not get between us and the wool. In any case, I started Ann Budd’s pattern, repeated it a few times, then simply stopped doing the “undulating” part of the rib and carried it down the leg. 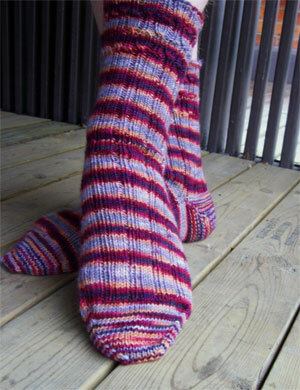 When I got to the heel I decided to work a garter stitch short row heel (same as here – only garter stitch) because I really liked the pretty spiral the yarn was making and my traditional heel (a flap heel) would have disrupted that. Heel completed, I carried the ribbing down the top of the foot and plain stockinette down the bottom of the foot, worked my usual toe and that’s all she wrote. Done like dinner. Finished like Rosie and Donald at an etiquette seminar or Nicole Richie at a dessert buffet. Totally done. I’m still not feeling at all well, but today is the first day since I arrived home that I feel better. The coughing has finally eased up enough that last night I slept in the bed with Joe (Joe’s working this week and there’s absolutely no point in both of us being up all night. I gracefully removed myself from our bed so he could sleep on- thus preserving his strength so he could cook, clean and work. We both thought this was very considerate of me) and the real sleep in a comfy bed did me some good. I’m still so tired that the kitchen seems far away and the coughing has left my neck, back and stomach sore in places I didn’t even know I have places, but none of that matters, since I don’t need any of them at all to knit, which, besides sleeping, is pretty much all that I’ve done. So, while I’m settled in, arse on chesterfield, yarn on lap… perhaps I’ll do an overview of what (besides Juno from yesterday) is on the needles? 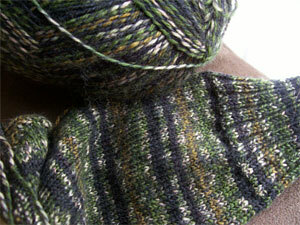 Large men’s socks, STR Medium-weight (I forget the colourway, somebody will know.) 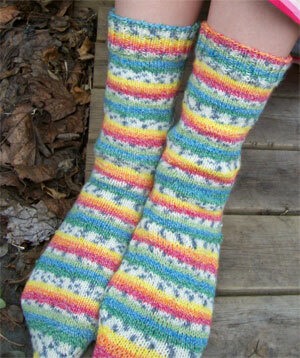 in my standard issue sock pattern. 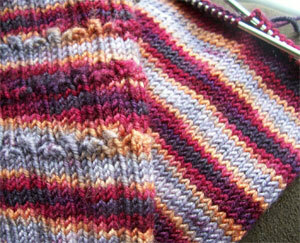 Though these are technically off the needles, they just came off this morning, so I say it still counts. These are destined for the long range planning box. 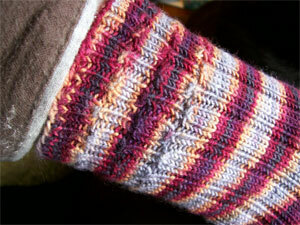 More socks, this time in STR Lightweight “Henpecked” with a bit of a pattern and en petit peu of a pattern at the tops. Almost done. Damn. Socks again. For crying out loud. 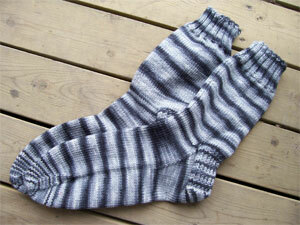 Thing is…I’ve been travelling and socks are a small good project and…. These ones are my standard issue socks in … well. It would appear I’ve misplaced the ball band on that. Probably left it in Minnesota or Colorado. 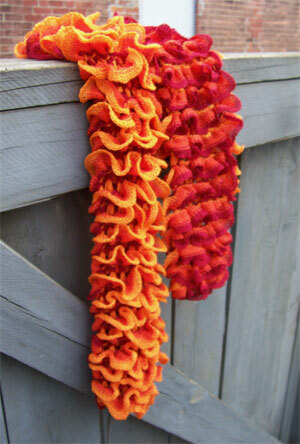 Anybody know what yarn that is? It’s wool for sure, maybe German? These are Cookie A.’s German Stockings. 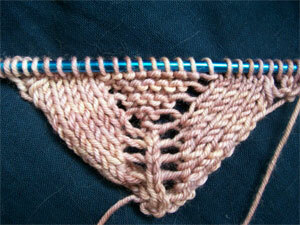 Coming along nicely, though the shaping I’ve done may resemble my legs the way that applesauce resembles an anaconda. I should really put my stitches on a thread and check, but if I’m right I’ll have to rip back pretty much the whole thing and I’ve knit so much that I can’t face it at the moment, especially since there’s no excuse at all. Cookie’s pattern gives so many sizes that the failure is entirely mine. Bummer. 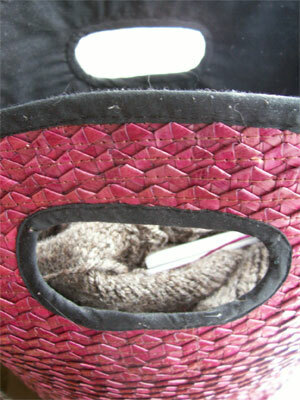 This is a secret project I’m working on that you’ll get to see when it’s off to it’s recipient. It’s working out very, very well and I’m having a wonderful time. If you know what it is…don’t guess out loud. 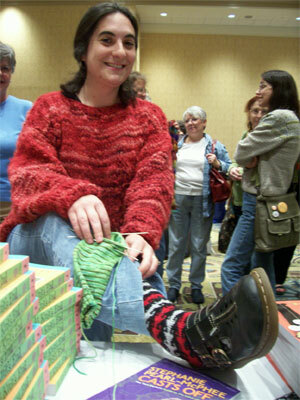 The knitter I’m sending it too could be lurking around here. I’m 1/3 of the way done and it has a deadline of “soon”. Snowdrops make mistakes. 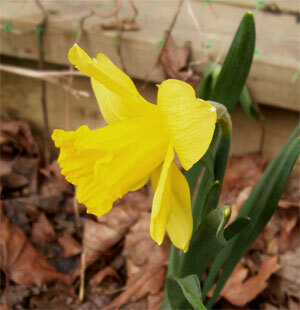 Scilla can rush in…but the Daffs, the Daffodils are spring, and since spring lasts about 10 minutes in Toronto before we are blasted with an inferno of a summer….nobody here will be needing a gansey for a bit. NB: to the list of projects admitted to here today: This is not a complete list. I shall never admit publicly to the full, complete and real list and any references to an project that is on the needles that I am ignoring or have abandoned will be ignored, even if you have photographic proof…even if I provided you with that proof myself through the miracle of blogging. 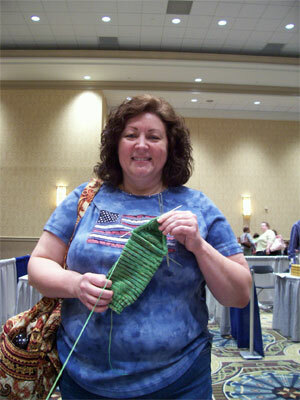 Every knitter has abandonment issues and a rate of disownment. Mine’s not too bad, but I’m still not copping to it. 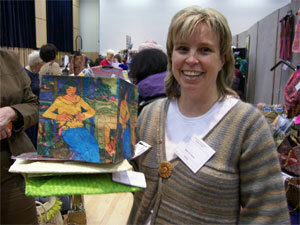 Besides…do you want to discuss what projects you have you stuffed in the back of the linen closet lately? In every knitters life, there are moments that seize ones being and catalyse an enormous seething reaction where you didn’t even know you needed something…and suddenly you can’t live without it. This does not happen to me very often. I am a knitter of some experience and immunity, and the longer I knit the less often I am totally possessed by something. Such was the case when I first saw Rowan’s Juno sweater. I liked it, and part of the charm was surely the name (being as fond as I am of the live Juno) …but dudes, the plunging neckline? The off the shoulder “I’m so cool I’m freezing” look? Not so much. 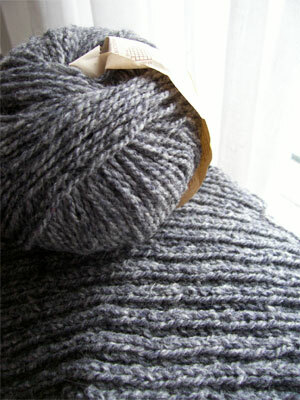 Plus, it was knit of Rowan Wool/Cotton held double, and no part of that sounded fun. I let it go. 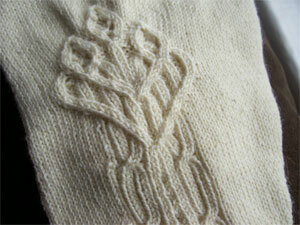 It was almost a perfect sweater, but knitting is way too slow an art to do anything that’s just “almost”. I knew…I . Must . Have . It . There are people in the world… Stacy and Clint among them, who would say that a woman possessing the lofty height of 5’1″ (almost) is not deserving (or in a position to be flattered by) a sweater with a large collar, but, my esteemed collegues…I say…. That sweater, (with Vanessa’s modifications) rocks it so simply hard, that I actually am delusional enough to believe that I would look like a million bucks in it, short…or not. 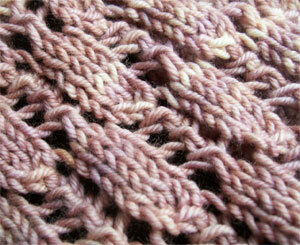 I’m knitting it. In other news, my 15 and 3/4 year old daughter Meg knit socks. 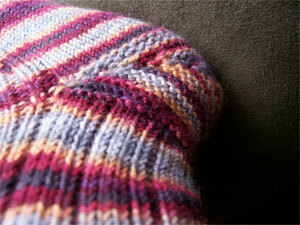 Pattern: Ask Meg. She invented it. 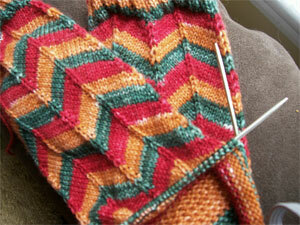 What do you get if you mix a sick knitter who’s been working flat out for 25 days with her home and no commitments? I got home on Sunday and stopped, or maybe the world stopped me. I’m not sure. The cold I’d been fighting off for days landed on me foursquare and my wool and I went to bed. Or Chesterfield, or chair or anywhere at all that wasn’t vertical. I’m feeling a little better today, but my expectations of myself are very low. Very. 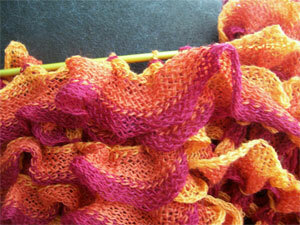 I knit a little bit. Before I went down hard though…I was in Kentucky, but before I tell you anything else, I want to talk about Fifth Third Bank. I, like everyone else in the world, has had a scam/phishing email from Fifth Third Bank. (Turns out that 98.13% of phishing emails are about it. Who knew?) So I would get these emails, urging me to do do any number of things. Send them my personal information, log onto a website and clear up some misconceptions, respond with my correct credit card number…all that stuff that a bank would never, ever ask you to do online. Every time I got one of them I marvelled at the stupidity of these guys. I mean, if you’re going to try and trick me into giving you my personal information so you can rob me blind…at least come up with a plausible name for a bank! Fifth Third Bank. C’mon. Seriously. Who’s going to believe that’s really the name of a bank? I chalked it up to someone with a poor grasp of English trying to make it sound official and missing the mark by a whole lot. Fifth Third. No way. 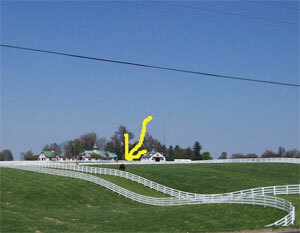 Then I’m walking down the street in Lexington and what do I see? Dudes! It’s a real bank! Seriously! I just can’t believe it. Does this simply STUN anyone else? 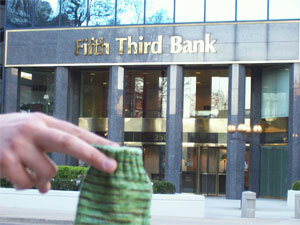 Fifth Third Bank. Unbelievable. and free-range. Here’s Denise and Melanie, come all the way from Georgia. I was very flattered. It looked like a book that had been useful. 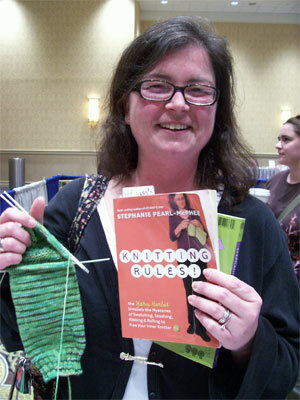 (Since I write mostly useless books about knitting, I was quite chuffed.) She got the new one too, I hope it has at least a few crumbs in it by now. I look forward to seeing it similarly abused- though it isn’t a very useful book. Cami was asked to make socks that don’t match. It’s giving her a twitch. She’s a woman after my own heart. 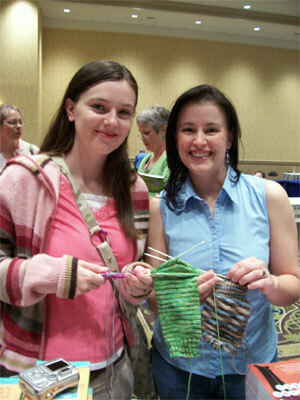 Holly postponed her wedding to hang with knitters. Yesterday my throat was really, really hurting me and I kept trying to swallow this lump that was there. I drank litres of juice and water and coffee and tea with lemon and honey and the lump just would not quit. It was about 5:00 when I confessed the lump to Joe, and he told me that I wasn’t going to be able to swallow it…what with it being MY OWN VOCAL CORDS. 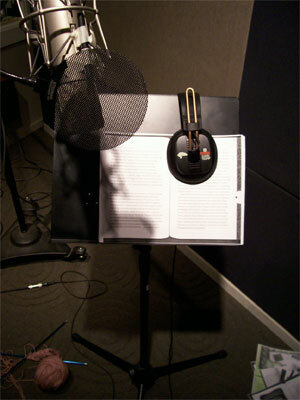 This Audiobook business is harder than it looks. (There. I said it. Audiobooks. The publisher sold the audio rights and they chose me to read it and Joe to engineer it and we’re doing it with an audiobook producer from NYC and …lets not talk about it anymore. Something about it is sort of…embarrassing or something. Avert your eyes. Look away. Let’s pretend I haven’t turned into some weirdo reading their own books for a living.) 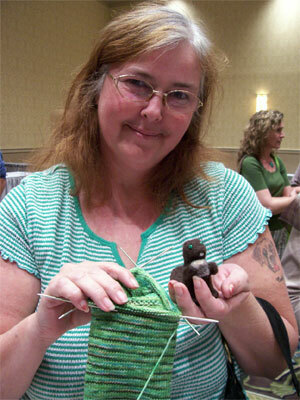 You can’t knit while you do it…you can’t make any noises at all. You have to do as you are told and read the book the way you wrote it…which is sort of a bummer because I thought of some better things to say, and here I’m locked in. This morning the voice is still touch and go, so Joe got me a whole bunch of drugs that are supposed to help and I’m not sure if they are working…but I know that the side effects are. (The world is a wee bit fuzzy round the edges.) With all goodness on our side we should finish around lunch time today and I’ll roll back home and pack my bags for tomorrow when I go to Kentucky. I’m really looking forward to this one. Not only is it in the South where it is warm, green and beautiful, but the event sounds like it’s going to be fabulous. 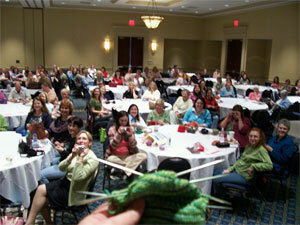 They have given the knitters a much bigger room than last time (!) 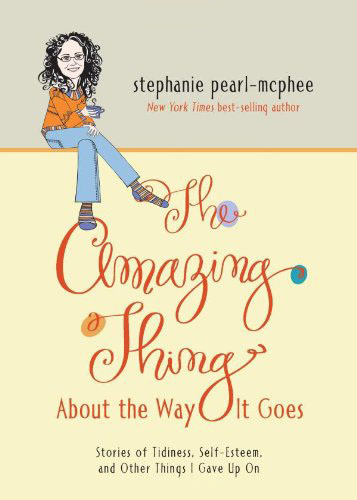 and the lovely ladies of Magpie Yarns are sticking around after and hosting a Sit’ n-knit to knit hats and after I talk… (And sign books, if you want me to.) I will be sitting. 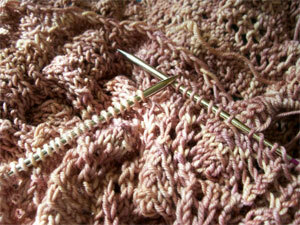 I will be knitting. It’s going to be awesome. 1. Today is an exceptionally special day. 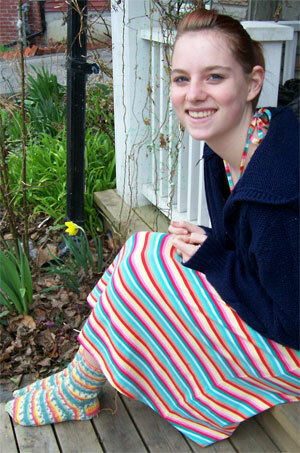 My darling Juno and the exquisitely blog-free Rachel H. both celebrate their birthdays today. Two of my favourite people both born this one day cannot be a coincidence… I suggest that we all eat cake and party hard. I love these ladies. Both of them had the audacity to come into my life when I believed that I had met most of the friends I needed or was entitled to. They were both a wonderful surprise, and I’m grateful for the shake-up. 2. I have decided what I’m doing with the beautiful Rose Quartz STR, but I’m not going to tell you.